The Cheltenham Festival is one of the most iconic and popular events in horse racing, and it just seems to get bigger and draw even more casual interest each year. The 2017 event will surely continue this trend as future stars are made and thousands of racing fans and punters descend on a small English town. The competition at Cheltenham is notoriously tough, and even among the experts, choosing winners can be quite the challenge. The best chances often lie in knowing when and where to look. But first, we are going to outline some of the top free bet offers for Cheltenham 2017 below where you can get up to £320 in free bets that you can use on Cheltenham! You can take advantage of all of these offers! Sign up to Ladbrokes and register with promo code GET30FREE, place your first bet of £10 and receive a THREE free bets worth £10 each – which you can use on any of the Cheltenham races. 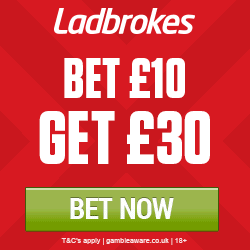 You can find complete details on the Ladbrokes promo code GET30FREE here. Join William Hill and register with promo code C30, then place your first bet of £10 and receive TWO free bets worth £10 each. Read a complete review of this William Hill promo code here. 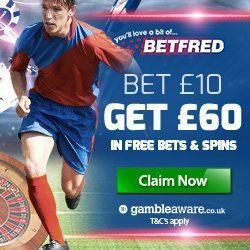 Sign up to Betfred and place your first wager of £10, and Betfred will award you a £30 free bet. Register with promo code BETFREE. In addition, 24 hours after your qualify bet has settled, Betfred will award you a £30 casino bonus! Read our complete review of the Betfred promo code here. To summarize, if you join all four bookmakers, just invest £240 and you will receive an additional £320 in bonus money! That’s free money on top of the £240 that you put in. And if you skip bet365, you only have to deposit £30 to receive £90 in free sports bets PLUS a £30 casino bonus. These are amazing offers and the perfect time to join these reputable sites for the free bet offers – and you can use all the free bets on Cheltenham! The Cheltenham Festival kicks off on March 14, a Tuesday, and features the Champion Hurdle. In fact, there are three hurdles that day along with four chases: the Supreme Novices’ Hurdle; Arkle Challenge Trophy; Festival Handicap Chase; Champion Hurdle; Mares’ Hurdle, which is for the David Nicholson Trophy; National Hunt Steeple Chase; and Novices’ Handicap Chase. The races begin at 1:30 in the afternoon local time, and the final race will be held at 5:30 that evening. The National Hunt Chase is one of the most popular races of the event, but it can also be among the most volatile due to the fact that all horses are ridden by amateur jockeys. The Champion Hurdle is not just a highlight of the day but of the entire event, and this promises to be among the most competitive races in years. The Supreme Novice’s Hurdle will get a lot of attention as well because it launches the event and because of competition between Willie Mullins and Nicky Henderson. The National Hunt Chase is a great spot to bet on long odds but not the place you want to find your sure thing. For many punters, the Arkle Challenge is the best race across all four days because of how much value there is down the field, but Altior is a great favorite. The Mares’ Hurdle has been dominated by Mullins and likely will be again. The second day of the event, known as Ladies Day, is Wednesday, March 15, and you’ll find nearly as much emphasis on fashion as on horse racing. Again, the first race begins at 1:30pm local time, and the final race of the day begins at 5:30pm. The highlight of day two is the 2017 Queen Mother Champion, and rounding out the festivities are six other intriguing races: the Novice’s Hurdle; RSA Steeple Chase; Coral Cup; Cross Country Handicap Chase; Juvenile Handicap Hurdle; and the Weatherbys Champion Bumper. Day two, all eyes will be on Douvan, who has proven to be nigh unbeatable and likely will be again as it battles the field in the Champion Chase. Other top races this day include the Neptune Novices’ Hurdle, which delivers future World Hurdle candidates, and the RSA Chase, which should be one of the most fun and competitive races of the event. It’s hard not to love the horse atop the Champion Chase odd-wise: Douvan, Altior, Un De Sceaux and Fox Norton. Might Bite and Coney Island are favorites for the RSA Chase, but any participant can win this one, and Carter Mckay remains a very popular pick for the Champion Bumper. Day three — better known as St Patrick’s Thursday — belongs to the Irish, and that may be true both figuratively and literally this year. Races begin at 1:30pm local time, and the last race is at 5:30pm. The showcase event of day three is certainly the 2017 Ladbrokes World Hurdle, but none of the day’s races should be overlooked, including the Novices’ Steeple Chase; Handicap Hurdle; Ryanair Chase; Handicap Steeple Chase; Kim Muir Challenge Cup; and St. Patrick’s Derby, a charity race. The two races you’ll want to pay close attention to this day are the World Hurdle, of course, and the Ryanair Chase. The Ryanair Chase has a history of helping punters identify the Gold Cup challengers to be. The Mares Novices’ Hurdle was new for last season and should get a lot of attention yet again. Favorites have an amazing history at the Stayers’ Hurdle. Unowhatimeanharry is the clear-cut favorite and has history on his side in a number of other ways as well. The Kim Muir Challenge Cup is one place books look to come out ahead, so perhaps don’t be overly bullish here. The JLT Novices’ Chase can be chaotic due to last-minute decisions, and there can be some great odds here if you wait. The event closes with Gold Cup Day. This fourth day is a Friday, March 17, and it features a truly explosive lineup that no horse racing fan will want to miss. The most notable race of the day is, of course, the 2017 Gold Cup. However, there are many important races, including the Triumph Hurdle; Handicap Hurdle; Novices’ Hurdle; Foxhunter Steeple Chase; Conditional Jockeys’ Handicap Hurdle; and Grand Annual Steeple Chase. The total prize pool for the Betfred Cheltenham Gold Cup is a staggering £550,000 this year! The Gold Cup will take center stage, and everyone is expecting a great heavyweight battle, but don’t let it overshadow so many other marquee matchups. The competition between Defi Du Seuil and Mega Fortune for the JCB Triumph is one to watch. Foxhunter is another one to watch as it has a reputation as a punters’ race. The County Handicap Hurdle is popular among punters because it’s all but guaranteed to give us a double-digit winner. The same is true of the Grand Annual Chase, and keep in mind that since 2004, just two favorites have won this one. On the flipside, Foxhunter is quite stable and predictable, and this is a great place to box a trifecta.